Philips Hue bulbs make it easy and convenient to turn on and off your lights, thanks to the ability to control them from your smartphone wherever you are. However, you can also use your Philips Hue lights to make really cool flashing animations to step up your house party game. We’ve talked about creating your own Philips Hue animations in the past using an awesome iPhone app called iConnectHue, but if you want specific, themed animations like a lightning storm or maybe some flickering bulbs to go along with your Halloween party, creating these yourself can be a challenge. The good news is that there are plenty of third-party Philips Hue apps that make this possible and allow you to perform all sorts of cool animations with your Hue lights. Here are some of our favorites. Music itself is a great way to get the party going, but what makes it even better is flashing lights synced to the music. 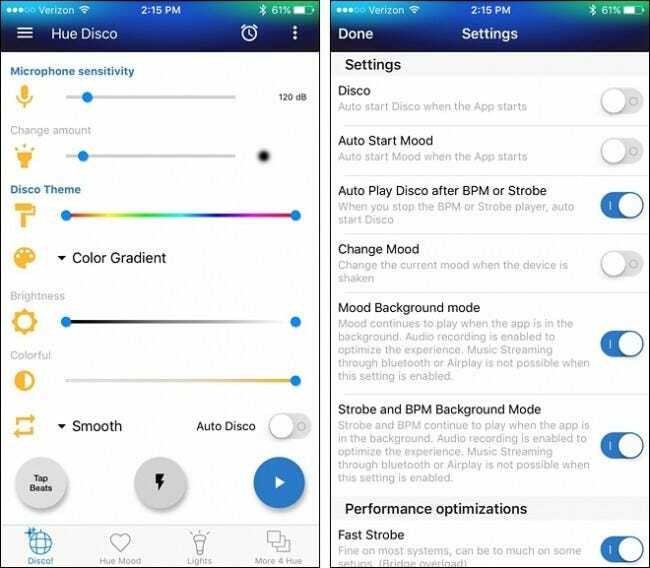 With an app called Hue Disco (iOS and Android), you can play any song you want and your Philips Hue lights will dance to the music. 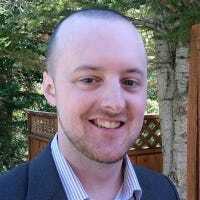 The app uses your smartphone’s mic to listen for any music coming from external speakers, and from that, will analyze the beats and do its best to sync the lights to the music. It’s not as good as I would expect, but it’s the best app out there that can do it, especially because of the extra features that you have access to, like controlling how much flashing and strobing you want. Halloween is a few months away, but there’s no harm in preparing your haunted house party right now, and your Philips Hue lights can really add to the whole haunted theme. 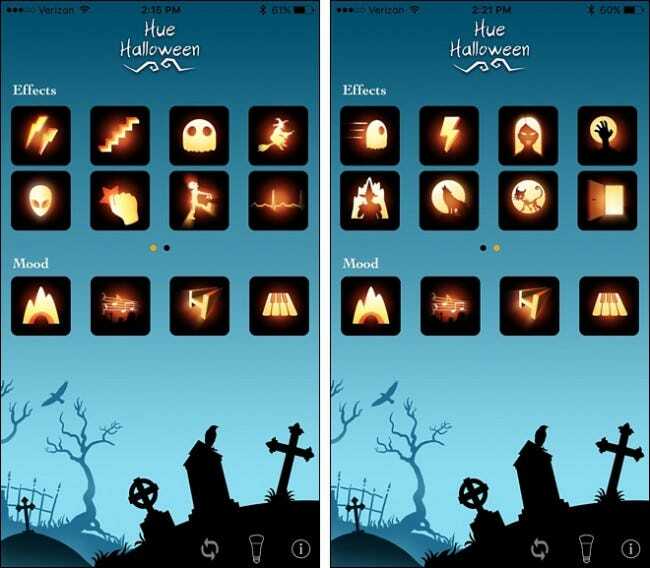 An app called Hue Halloween (iOS and Android) allows you to change your lights to display dark and dreary colors, as well as play different Halloween-themed music bits. There’s also a handful of different sound bites you can play that also come with their own light animations. There are sounds such as a witch’s cackle, lightning and thunder, and of course the creepy little girl’s voice. The July 4th holiday may be over, but that doesn’t mean you can’t put on your own fireworks show inside your house whenever you want. 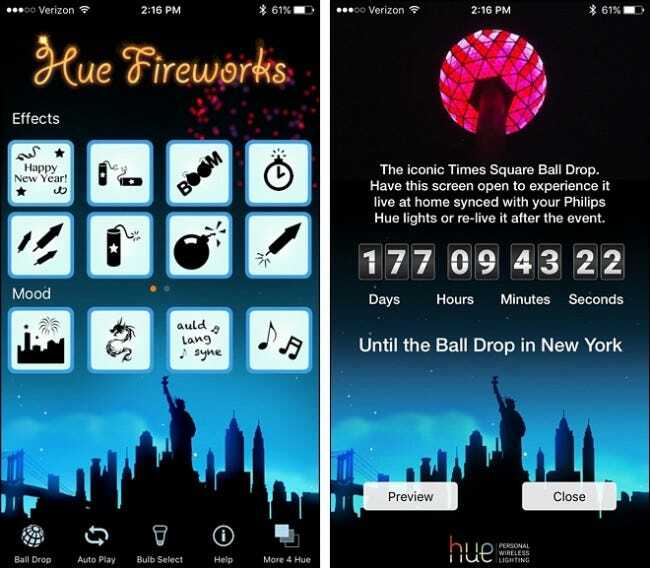 Hue Fireworks (iOS and Android) is a simple app that lets you play a fireworks show, complete with the sound effects and lighting effects. There are even shorter sound bites you can play that simulate firecrackers, bottle rockets, and more. There’s also a New Year’s Eve theme to the app as well, so even if July 4th has already passed, there’s another event that you can look forward to with fireworks. If you’re watching a movie at home on your own big screen, cranking the speakers is a great way to immerse yourself in the action, but you can also get your Philips Hue lights involved as well. With Hue Camera for iOS and Huey for Android, you can use your smartphone’s camera and point it at your television. 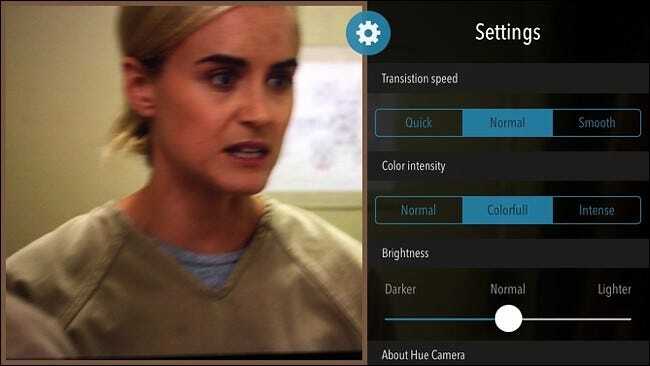 From there, the app analyzes the colors displayed in the movie and changes the colors of your Hue lights to match, so if there’s a scene in a grassy field, the bulbs will turn green, and if there’s a fiery scene, your lights turn red and orange. I find it works best with animated movies with lots of color, but you can also point the camera at anything and watch your Hue lights automatically change.